Peter Stetina locks hands with a fellow rider after finishing last year's Stetina’s Sierra Prospect. Professional cyclist Peter Stetina will return to the area this weekend, bringing a host of fellow professionals for the second annual Stetina’s Sierra Prospect. This year’s ride, which takes racers on a 77-mile from Northstar California Resort to Carson City and up Mount Rose Highway, will highlight this year’s Northstar Free-Ride Festival. The festival at Northstar will kick off on Friday, Sept. 14, with afternoon yoga at the resort, followed by a village wine walk. Saturday’s festivities bring more yoga, the electric mountain bike Boogaloo Race, bike demos, a pub crawl, and the premier of the film Red Bull North of Nightfall. The night will concluded with the High Fives Gala, featuring Stetina, cycling legend Levi Leipheimer, Olympian Marco Sullivan, and others for dinner and a fundraiser for the High Fives Foundation. The gala is sold out, but tickets can possibly be obtained by emailing info@bikemonkey.com. The festival’s final day features the Sierra Prospect, taking riders from Northstar, around Tahoe’s east shore, down US Route 50, and into Carson. From there the route takes competitors through Washoe Valley, and then up Mount Rose Highway to the finish line at Mount Rose Ski Tahoe. Shuttles will be available to take riders back to the award ceremony at Northstar, or they can join Stetina on a group ride back to the resort. Last year’s race was won by Leipheimer, who completed the five stages of the road rally format with a time of 1 hour, 41 minutes, 51 seconds. While the ride is competitive with awards for the top finishers, many of the elite riders have said they don’t take the competitive aspect seriously. The rally format breaks the route up into timed and untimed segments, which allows for the pack of cyclists to group back up at the end up each segment, before heading out together on the next. 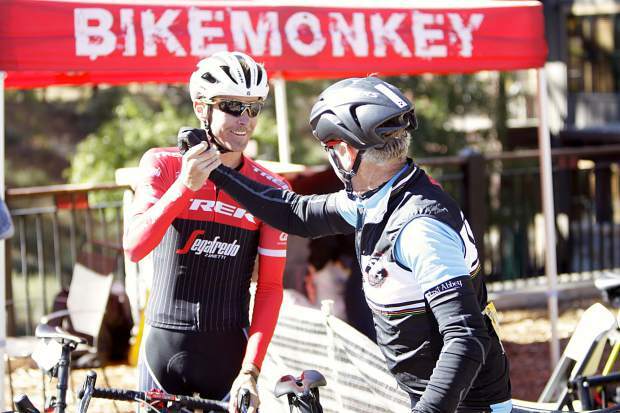 The format also allows for amateur riders to rub shoulders with the sport’s greats like Stetina and Leipheimer. Aside from Stetina’s Sierra Prospect, the final day of the festival will include a downhill race at Northstar, beginning at 12:30 p.m. and running until late afternoon. There will also be more yoga, bike demos and Boogaloo demoing. For more information visit NorthstarCalifornia.com or SierraProspect.com.